Marlborough – Pet Source in Marlborough, in conjunction with the United States War Dogs Association, Fred Levy Art Photography, and Stiggy&apos;s Dogs, is asking you to lend a helping hand for the men, women and dogs serving in the U.S. military. A photo shoot will be held Saturday, July 7, from 12 to 4 p.m., for $25. All photos will be sent to the troops inside Paws 4 Freedom care packages. The cost includes a 5″ by 7″ print of your choice and a free goodie bag (a $20 value). Pet Source is located 141 Boston Post Road West (Route 20), Marlborough, and can be called at 508-229-7792 for an appointment or more information. Look for their ad in this week&apos;s paper. Westborough – Boston Lawnmower, located on Route 9 west in Westborough, is pleased to announce their annual June special: 50% off pick-up and delivery within the local area when you schedule your lawn equipment service by June 30, 2012. Visit www.bostonlawnmower.com for additional information on the Boston Lawnmower June Service Special and for information on all the products you need to care for your lawn.? Contact the Boston Lawnmower Company at 508-898-3500 to schedule your service today! Northborough – When was the last time you felt fantastic? Well, it is time to feel that way again. Dan Candell and his associate, Deidre McKeating-Eck, will be bringing a new methodology to weight loss. As certified virtual lapband specialists, they will be hypnotizing people over the course of six to eight sessions into “thinking” that they have undergone the gastric lapband procedure. Unlike the surgery, there are no risks involved. This is an extremely effective way to lose large amounts of weight. This is not a diet, but a new way to feel full with very small quantities of food. Visit www.dancandellhypnosis.com or call 508-393-8690 and set up a free consultation. Southborough – Small and sour! At Culinary Underground School for Home Cooks in Southborough, find out what that means during the Pastry Sunday: Sourdough Workshop, to be held June 17 from 10 a.m. to 3 p.m. This is a great time of year to begin a sourdough starter, and Culinary Underground will show you how to make your starter (which you can take home with you), the care and feeding of it, how to troubleshoot reluctant starters, and then make some small breads. Cost is $75 per person, and registration is required. For more information, go to www.culinaryunderground.com or call 508-904-6589. Marlborough – Silva&apos;s Market, located at 530 Boston Post Rd East (Route 20) in Marlborough, will be hosting a food sampling Saturday, June 16, from 11 a.m. to 2 p.m. Stop by and enjoy samples of their homemade all-natural breads, pastries, marinated meats, and more. 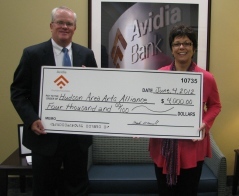 Hudson – The Avidia Bank Charitable Foundation recently made a $4,000 donation to the Hudson Area Arts Alliance. 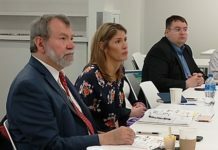 Avidia Bank is a $1 billion mutual community bank, headquartered in Hudson, with branches in Hudson, Westborough, Clinton, Leominster, Marlborough, Northborough and Shrewsbury.